Planting Cabbages: The Cooking Life: Why I Must (Never) Leave Chinese Food. And Old Shanghai. The Cooking Life: Why I Must (Never) Leave Chinese Food. And Old Shanghai. New Years Day 2015, and lo and behold.... I've got food on my mind. Before the holidays ~ and their soft silky glow ~ leave us, may I ask you a personal question: have you fallen head over heels for a food? Group of foods? Is it "your heritage" food? What calls you? Do you celebrate with different foods than your birth family? Wait though, group of foods, that’s so not the phrase I’m looking for. Nope, that's not the ambiance at all. But don't let the lack of that detail prevent you from heading in to this exploration, we'll figure it out together, I promise. Whenever I was missing my two sons, who had grown up and were happily going about doing their thing, I would go out for Chinese food. You guessed it. I admit it. And it got bad. After umpteen fat and crispy eggrolls dipped in duck sauce and hot mustard, platters of Vietnamese cha gio cushioned by green leaf lettuce and bean sprouts, slippery bowls of hot and sour soup that sting your winter weary throat, egg foo young – sitting quiet and simple on the plate waiting for your chopsticks, spicy peanut noodles, and deep cavernous bowls of pho topped with a sea of cilantro and basil and mint life-rafts, I came to the screaming decision that whatever it was about this plethora of plumpness (not mine...hey!) I had to control my addiction by doing the only sane thing. Abandon ship and go cold turkey (not with szechuan spices..or sticky rice, please, oh god, can't we have just a little!) without Chinese food. I beg your temporal and temporary collusion on calling all of this Chinese food..it’s not, I know. I was literally beside myself with conviction. I would be steadfast. Wasn't it ok to want to recreate the tables of the past? That sounded suspiciously like backsliding and rationalizing, and so I did what any other person would do. I sternly took myself by the hand. I held fast. I broke a few dozen chopsticks over my knee. I threw away the "to go" packets of chinese mustard. I stomped and sobbed and lobbed bamboo steamer baskets into the woods. I would not succumb. I emptied jars of plum sauce into the compost pile, annointing them with salty tears. Rice noodles got sent up, and down the creek without a rice paddle. I burned all my fortunes. Well, now.. no. I couldn't bring myself to that, I am reasonable after all. After I calmed down, I took a cold hard look at the enemy, Eggrolls Past, and how this came to me. To be me. I rolled the camera back. Chinese food was as foreign a food as a food could be when I was growing up in Reading, Pa. There I was surrounded by Liver Pudding, Schnitz and Ep, Bot Boi, AP Cakes, and ...lots of Germanish dishes. Was Chinese around when you were growing up? It was a lot like A Christmas Story - (click the link and travel to the Christmas Story Museum in Cleveland, Ohio -- who knew?) where Ralphie wants a Red Ryder BB Gun, and on Christmas Day they are forced to go out for Chinese as the hounds next door ran-sacked the turkey. We never had to do that with Nana standing duty by our turkey on Christmas. But my adopted mom, Aileen, married a Jewish man the second time around, and while I am not sure of the exact pathway, it seems we developed a love for Chinese food after that. Chop Suey and Chicken Chow Mein. I can still see the neon sign for the restaurant in Mohnton, Pa. The Far East Peking House or something like that? I can't decipher the name but I can taste the crunchy noodles, and that's more important... wahhhhhh! Erick was seated in a high chair, though at five months he was not ready for that. So my husband held him in his lap. Our dinner arrived, and the steam swirled around and under and gently embraced us with a perfume of exotic oneness. Erick’s face brightened as he tasted a small spoonful. His mouth fell open. "Wow this is wild. This is delicious. What is this?" It was the ever devilish, fried rice. Another scene crystallized through the mists of ...egg drop soup. Back in the day in Colorado Springs we often visited Mekong restaurant on the south side of town, owned by Dang Truong and his family. They made us feel like we were home. They made us feel like family as Dang always welcomed us and during the Dinner of Seven Beef Dishes carried Erick around the restaurant and into the kitchen, his first restaurant kitchen calling him Super Boy. 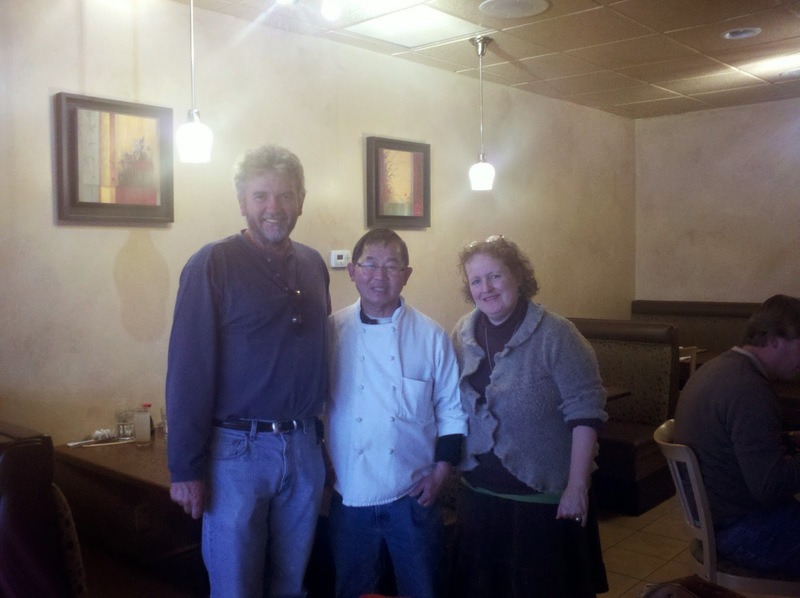 We were lucky enough to visit some old time friends in Colorado Springs and see Dang again in his new place Lemongrass Bistro. Both my sons grew up amidst a backdrop of Chinese and myriad of Asian food ~ along with French and Italian and Mexican and Southern with a little Shoofly Pie and Sticky Buns thrown in for good measure. But am I sorry to say that Pennsylvania Dutch food didn't maintain it's place in my heart as it did when I was little? Sure. I wanted to have what I thought others always had, a family food. So why was I so fast to discard what was given so freely to me? Did it feel like it didn't really belong to me? I hope I was grateful. I felt grateful, especially to Nana. But maybe I never said a word. Maybe she understood as we sat at the table joined by eating our bowls of chicken corn soup? And what would she say about all this Chinese food? If I had been enamored of say, always making pork and sauerkraut on New Year's Day as Pa Dutch tradition demands, wouldn't I be denying the food and the people where I was living? I had changed. After I left Pa. I celebrated and searched and shared a multitude of yummy ways of looking at the world. I didn't worry about what I had left. I quite possibly was consumed with I for I was young. For me and for us, Chinese food came to mean family, and celebrations, and spending time together with our sons. We had moved away, and embraced a new life. The nights we got take out Chinese were a delicious "wok" of WE. And by we I mean all of us, everywhere. I believe eggrolls and dumplings helped us celebrate being as different and perhaps pilgramatic, as say Chinese food on Christmas. My sons grew up to celebrate, gulp, the same things -- the reasons they flew the coop were not the same as when we had, right? To test out their wings and find new...family! In fact they return to the coop. And we to theirs. Gosh, were they living what we had, in fact, done? And taught them? How did this happen? 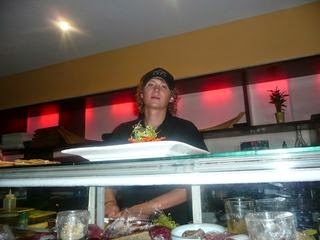 Colorado is where my oldest son, Erick, returned, and is the executive sushi chef at Sato in Edwards. Kayla, his girlfriend works there too, and has the most amazing and descriptive palate and aspires to new adventures of her own. Their world is chock a block and blazes full of snow storms, fish and rice (not usually fried) and kombu. My youngest son, Jaryd, is entrenched in the LA world at Dreamworks where he works on dragons and cavemen during the day. Ana, his girlfriend is studying urban planning and public health at UCLA and together they love sharing Nicaraguan, Brazilian, Ethiopian, and Houses where Dumplings number in the hundreds for choosing at will. As I may have said, have I OVEREMPHASIZED THIS POINT? both of my sons are grown up now and off in the world doing their delightful thing, as I did. They may be gone, but I realized they are not far away. How I wish I could thank Nana, talk to her. Let her know that even as I moved away, I held her close and cherished all the times in her kitchen, what she showed me. What she told me about life through the stove, and the stirring. And what would I be showing my sons if I stopped eating Chinese food? The very epitome of what we shared and cherished. What made me lift the ban on Bahn Mie or Pork Steamed Buns, was the same thing that led me to abolish it, celebration. Suddenly bowls of Pho that once seemed so full, and yet so empty, swirled and were swilled. This holiday season we had a wonderful wonderful time with both Jaryd and his girlfriend Ana and with Erick and his girlfriend Kayla as we made cha gio (and other things too) in the kitchen. Was it sharing this ritual with their special someone's that made things OK? Perhaps it was. It definitely was! Is there change afoot? In buckets!! Am I a Drama Mama? I am perhaps, but count me ready. So, full circle back to the beginning. What makes you fall so foolishly for a group of foods? Aha, Group, is definitely not the right word; but maybe, just maybe, Family, is. 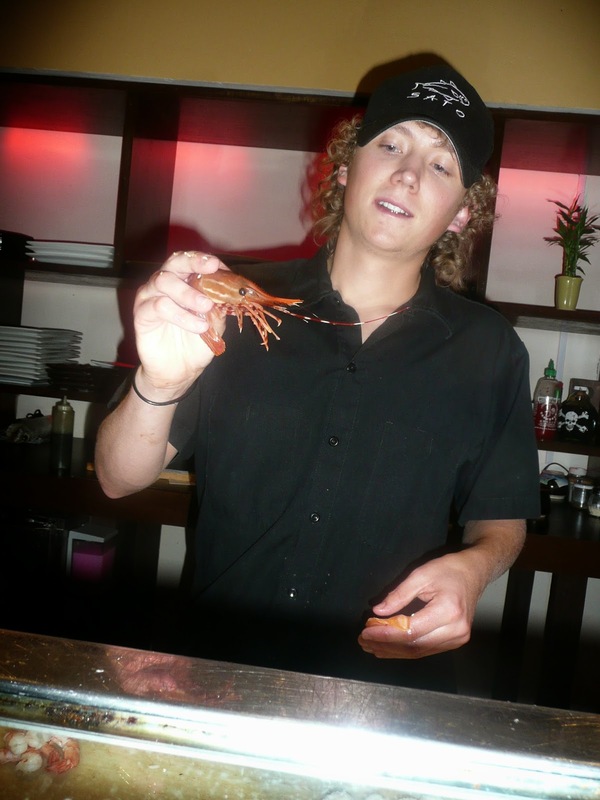 Erick manning Sato's Sushi Bar, circa 2009. Jaryd extolling the virtues of ...cha gio. our family loves these spring rolls so much that when we moved from colorado springs, where we became addicted to them, we began to prepare them for our christmas eve repasts. using the work bowl of a food processor fitted with a steel knife, process the lemon grass, carrots, garlic, and scallions until finely chopped. add the raw shrimp, ground pork, black pepper, fish sauce, and the egg and process until well blended. fill a mixing bowl with warm water in which you’ve dissolved the 1/2 cup sugar. handle the rice paper with care as they can be brittle. sweetening the water helps the rolls turn a golden brown when fried. one at a time immerse the sheet in the warm water and remove it to a clean countertop. continue in this fashion, dipping and laying out the moistened rice paper till you have about a dozen. place about a tablespoon of filling in the bottom third of the rice paper. fold up from the bottom, the rice paper can be quite sticky and stretchy, resilient even. fold over and cover up the filling, and shape into a log. then fold in the two sides and roll up burrito fashion being sure to completely enclose the filling. it is very important to roll them tight so they won’t break open during the frying. if one should tear, double roll it, by moistening another rice paper and enclosing the torn eggroll in that. continue until all the filling is used. in a medium bowl, combine the chile, sugar, vinegar, fish sauce, lime juice and garlic. stir to blend. set the sauce aside. wash the lettuce and leave the herbs whole, placing on the same platter as the lettuces. refrigerate till ready to eat. if possible fry in 2 woks or deep pots. pour 3 to 4 inches of oil into each skillet and heat to 400 degrees. working in batches, add some of the rolls to each skillet, but do not crowd or let them touch, or they will stick together. fry for 5-6 minutes, turning often, until golden and crisp. remove the rolls with a bamboo skimmer and drain on paper towels. keep warm in a low oven while frying the remaining rolls. serve with the fish sauce and suggested accompaniments. I have always wanted to try making spring rolls but have been scared. Rice paper just sounds so fragile! hi Miranda, thanks for being here. Always nice to meet someone from the "hood.." :) Sounds like you may have been to the Green Dragon Farmer's Market!? Rice paper is actually really resilient and stretchy and easy to work with, its just an experience thing, and once you try it..I think you're gonna love it. Hope you do! Are you making pork and sauerkraut today? Loved the story. My three daughters are adopted from Vietnam - and you would think I would have perfected spring rolls - but I haven't even tried! hi Pam, thanks for stopping by here on what must be a busy day for you - like every day? sounds like you have your hands delightfully full! enjoy these years! do you make other vietnamese dishes? would love to read your story about this! Happy New Year! Susan, Happy 2015! I really look forward to your January posts! There IS so much to explore ~ and "chow fun" to hear about your Friday family ritual. Do you still do that now? Sounds like you're way beyond the fried rice border now. Thanks for being a part of Planting Cabbages today! This is amazing! I love spring rolls, and I'm always looking for new recipes to try. Thanks for sharing! Nicole, Thanks for coming over to PlantingCabbages. Right after I posted this story I began a wicked fever, not related I don't think...:) so sorry to be late in replying! Sounds like you are game for frying up a batch! Look forward to more of your recipes..have an awesome beginning of 2015!